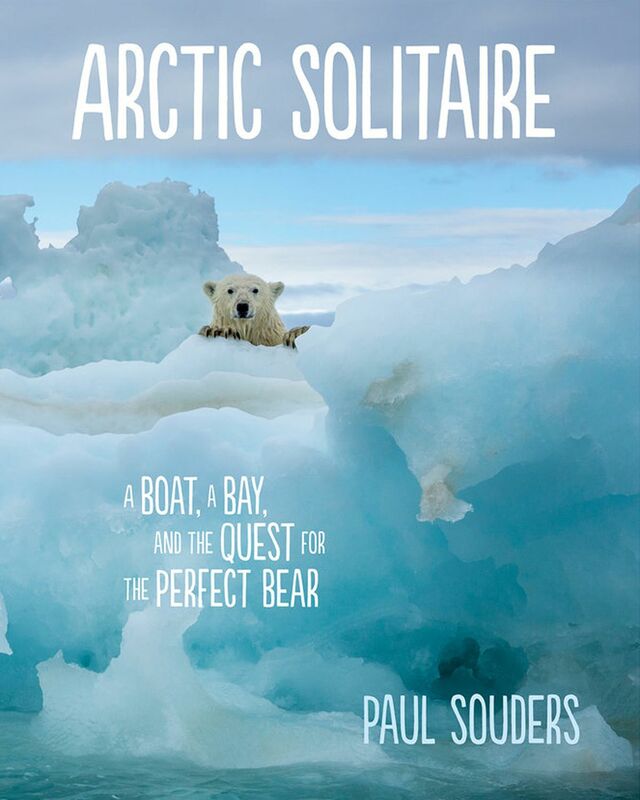 Arctic Solitaire: A Boat, a Bay, and the Quest for the Perfect Bear, by Paul Souders. Mountaineers Books, 2018. 304 pages. $26.95. Paul Souders, who worked as a staff photographer for the Anchorage Daily News years ago, went on to photograph wild places and wildlife on all seven continents for such publications as National Geographic and Time. He's also won numerous photography awards. In "Arctic Solitaire," his first book, Souders proves that he can bring his watchful eye to the work of a writer. His introspection and wit are on fine display as he examines both the natural world and his own passions as an adventurer-photographer. Sounder spends some introductory chapters describing his "weaving and erratic career trail." The arc follows his boyhood with a camera and a dream, his initial forays into traveling the world as a war photographer, his five years in Alaska, his stumbling through freelance work, a gig as an "anonymous content provider" for a Bill Gates' enterprise and his return to northern waters in an inflatable Zodiac. Then Souders settles into his main story — three summers spent traveling in Canada's Hudson Bay in pursuit of "the perfect bear." This involved first towing his 22-foot fiberglass boat from Seattle to launch into a river in northern Manitoba and then boating a thousand miles along the western shore of Hudson Bay as far as the Arctic Circle. "All the easy pictures have been taken," Souders writes. "But I'm here to tell you there are still some stupid and crazy ones left out there." Between the advent of digital cameras that made everyone a photographer and the growth of world travel, it seemed to Souders that the world had plenty of look-alike wildlife photos. He needed to do something different, something that only he could do. Why not seek out polar bears in their natural habitat? "Go before doubt creeps in," he told himself at the outset, "and then figure things out along the way. I wasn't getting any younger and I imagined that, if nothing else, I could fail in truly spectacular and memorable fashion." If the author was as daring and inept as he paints himself to be, it's a wonder that he survived his time in the Arctic. His adventures with storms, high seas, ice, cold, broken equipment, balky outboards, carnivorous animals, wary hunters, and sleepless exhaustion will keep readers on the edges of their comfy sofas even as they shake their heads at the degree to which he pushed his luck. Although Souders was the lone adventurer on his boat, he relied on satellite calls with his wife back home in Seattle for weather forecasts. In contrast to his manic and often desperate personality, she comes through as a voice of practicality and a calming influence. "Cut off the green bits, it'll be fine," she advises when he asks about moldy food. And, "You've got at least two more days of this wind. I hope you brought along less depressing music this time." Then there was the time he ran his boat up on a beach to prevent it being crushed by ice, and he left her a phone message mentioning "a bit of a situation" and asking her to look up the numbers for his boat insurance policy. Depressing music and opportunities for ice imprisonment and shipwreck aside, Souders also entertains by sharing from his on-board library of books about historic arctic expeditions, most of which ended in frozen death. These include narratives of Henry Hudson's and Jens Munk's seventeenth-century tragedies, the better-known John Franklin nineteenth-century tragedy, and others. "If there is one constant in the centuries of Arctic exploration it's this: everyone who came here suffered, and most all of them wrote about it in excruciating detail." Throughout, Souders' own writing is often beautifully evocative. For example: "While I was cutting the anchor free, green specks of bioluminescence glowed among the tangled grass and mud, tiny jewels amidst the cold and dark and muck." Then there are the photos, nearly fifty of them strategically placed within the text, adding to the reading experience and outstanding in their own right. If the author sometimes went weeks without even seeing polar bears and, when he did, seldom met with the right light, distance, angles, or preparedness for photographing, on a very few occasions he did manage to capture his "perfect bear." He also successfully made impressive images of beluga whales, walrus, and the larger environment of tundra, ice, and sky. Some of the best, most unusual photos are of bears underwater, viewed from either above or below the surface. In one, a bear is swimming towards the camera, with head out and giant paw reaching. Another photo captures just the black open mouth and yellowed teeth of a ferocious-looking swimming bear. We learn from the text that the camera in the latter case was at the end of a pole held from a Zodiac and that the bear both bit the camera and then the inflatable boat, popping a tube. "At the sudden whoosh of compressed air, I knew I'd stepped over the line from incautious, stumbled past stupid, and careened into the realm of suicidal." Although Souders did not intentionally harass wildlife, it seems from his descriptions that he sometimes crowded them. He does not, in his narrative, discuss the ethics involved in wildlife photography — such as maintaining safe and responsible distances. When animals are already stressed by conditions (as polar bears are by the loss of sea ice), added disturbances that interfere with their normal behaviors can further stress them. Souders' story might have benefited from some reflection about the conservation status of polar bears in Hudson Bay and the world, including how our awareness of their beauty and vulnerability could be directed towards their protection. One area where Souders does reflect on his behavior involves his relationship to the First Nations communities and subsistence hunters he met along the way. He early on decided to limit his interactions with the handful of isolated towns to short stops for purchasing gas. People he met were generally suspicious of an outsider and repeatedly asked him if he was with Greenpeace; these concerns later grew into beliefs that he was using underwater sonar to scare animals away from hunters. Souders eventually learned that everyone might have been happier if he'd done more to introduce himself and his project and sought approval for his wanderings through local waters. At its heart, Arctic Solitaire is both a paean and a caution to following one's passion to the ends of the earth. Few of us would push so far in pursuit of something as ethereal as a photograph, and fewer would attempt it alone. Souders illuminates what it is to follow a dream to extremes, and he does this with humor, humility, and, in the end, some serious thinking about what is most important in life.